What legal remedies for compensation could I have if I developed an illness due to silica exposure at my job? If you are exposed to silica on the job, you are in danger of suffering debilitating illnesses like lung cancer, kidney disease, and silicosis—an irreversible lung disease that is often fatal. Unfortunately you may not experience symptoms until decades after your exposure. Fortunately, this does not mean that you have no legal options to obtain the compensation you need and deserve. Who Can You Sue If You Develop an Occupational Disease? Your employer. You may be entitled to workers’ compensation benefits to pay for your lost wages and medical bills if you were exposed to silica at work. However, you cannot receive any compensation for your pain and suffering under New Jersey’s workers’ compensation laws, which is one reason pursing other liable parties can be beneficial. Suppliers and manufacturers. Manufacturers and suppliers of silica-based products like blasting sand can be sued if their product did not meet minimal safety standards or was unreasonably unsafe. In addition, they could be responsible if they failed to adequately warn of the hazards of their product. Manufacturers of equipment. If the machinery used with silica-based products was designed in a way that increased your exposure to this toxic substance, you may have a products liability claim against the manufacturer. Manufacturers of safety equipment. 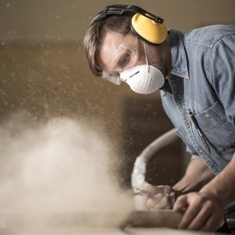 Safety equipment is crucial to limiting a worker’s exposure to silica. If your safety equipment, such as a respirator or dust mask, was defective, the manufacturer could be responsible for compensating you. You need an experienced workers’ compensation attorney who can thoroughly investigate your claim and identify all responsible parties. Start an online chat today to schedule a free, no-obligation consultation to learn about your legal options.